Just in case no one has tested the Delock FireWire 800 CompactFlash reader under Linux, the good folks at EverythingHerePlus have. They write about it here and here. The CompactFlash cards they tested aren't of much interest for DSLR folks, so I won't post the actual benchmarks here. Those interested can check out the previous mentioned posts. They used the benchmarking feature of the linux app Disk Utility 3.0.2, and listed their test platform as follows. 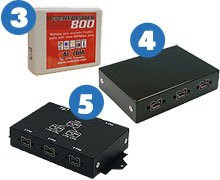 For older Linux systems without SuperSpeed USB 3.0, using FireWire 800 or even FireWire 400 is going to provide much better performance reading high end CompactFlash cards. 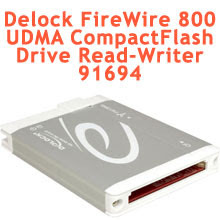 The Delock 91694 FireWire CF CompactFlash Reader FireWire 800/IEEE 1394B is an excellent piece of hardware. I'll try to get them to test some higher speed CompactFlash on their setup soon.